The Fellowship was fortunate enough to obtain a copy of HACK/SLASH RESURRECTION #1 from Image Comics. Tini Howard writes, Celor draws, K. Michael Russell colors, and Crank! letters. Cassie’s got everything she needs to enjoy her retirement from monster hunting. She’s got a quiet trailer out in the middle of nowhere, she’s making enough to live on playing video games, and yeah, okay, she’s getting bored. The occasional zombie showing up at her trailer is weird, but then she gets a call from an old acquaintance offering her a job at a local camp. Sounds simple enough, right? Everyone’s favorite monster hunter is back! It’s a little different without Vlad, but Cassie’s still her usual quirky self. The original series was a lot of fun, and this new episode promises more of the same. It’s got a little nostalgia, a little mystery, and a whole lot of fantastic art (and a gaggle of well-armed children, but no spoilers here). I’m glad to see Hack/Slash back on the shelves again. It’s horror comedy at its finest, and you definitely want to go get on board with this series. 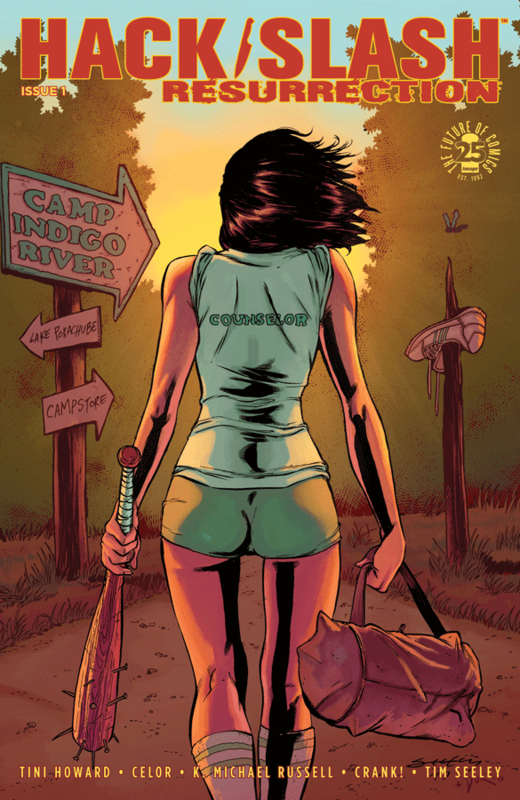 HACK/SLASH RESURRECTION #1 is available now from your local comic shop, or online at imagecomics.com.